How engineering is helping to build centres of learning excellence across the UK, Paul Jarvis, Director at Thomasons, explains. Although very much behind-the-scenes, a structural engineer plays a key role in the design of world-class educational buildings. We provide essential consultancy on everything from the construction of nurseries and primary schools to the conceptualisation of universities and other centres of higher education. Our approach to the design and construction of educational facilities has changed a great deal in recent years. As such there are many more design requirements which need to be considered and regulations which need to be met in order to create environments where young people can excel, mentally and physically. Our role is to help architects and designers realise their blueprint vision, whilst delivering structures which are robust and fit-for-purpose. From time-honoured techniques to the latest innovation, I’ll be looking into how engineering is helping to deliver centres of learning excellence across the UK. There are now a myriad of architectural ‘essentials’ which make up the modern educational building. One which immediately springs to mind is the current desire to achieve open plan spaces, with plenty of natural light and ventilation while also providing a safe, robust yet cost effective and sustainable structure. It’s a tough balance to strike, and that’s where structural engineers come in. Essentially, the structural solution needs to support future flexibility, allowing for short term changes of layout and use as well as long term expansion. Careful location of load-bearing columns and walls is key to designing schools that are able to respond to change quickly, minimising disruptive construction work. This is well encapsulated in a catchphrase that is often applied to the design of schools: ‘long life, loose fit’. At Tormead School in Guildford, we utilised a lightweight ETFE roof comprising a series of inflated cushions supported via curved circular steel sections to span over the dining hall creating a fantastic open plan architectural space with excellent levels of natural light. Looking towards material innovations which are helping to meet this increasing appetite for open plan spaces, there have been some very interesting recent developments. Developments in terms of Structural Insulated Panel Systems (SIPS), cross-laminated timber panels (CLT), and Glulam space frames often combined with hybrid steel tension members are providing exciting opportunities for structural engineers. The use of these timber engineered products enables a higher degree of off-site manufacturing and fast factory quality construction combined with good inherent airtightness and self-finishing. 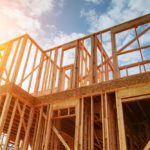 Additionally these methods of construction offer real benefits in terms of low environmental impact providing the timber is responsibly sourced. There has also been a definitive rise in student accommodation to complement an increase in higher-education academic facilities. For these projects, architects are becoming extremely creative. We are noticing a growing emphasis on embracing off-site manufacture and timber engineered structural solutions. In line with the material innovations mentioned above, the boundaries of timber structures are being pushed further on a daily basis. For example, the Structural Award-winning Tallwood House is a mass timber-hybrid student residence at the University of British Columbia and at 18 storeys is one of the world’s tallest contemporary timber buildings. The structure comprises 17 storeys of prefabricated timber construction over a reinforced concrete podium incorporating two reinforced concrete cores that house elevators, stairs and services conduits. It is a building which is truly ahead of its time. With regards to how a well engineered project can help to improve educational standards, it is known that well designed schools raise the aspirations and achievement of the students that use them, help to retain and motivate staff and raise the overall morale of the school. The structural engineer working closely with the architect, and the services engineer, plays a fundamental role in designing great schools. Spaces within school buildings need to be flexible and facilitate everything from individual study to large classrooms or even lecture theatres. Putting theory into practice, at Bedford Modern School Science block we designed a structure that formed cutting edge laboratory spaces wrapped around a central teaching theatre. No one structural solution fits all spaces, so concrete framed construction was utilised for the laboratory spaces and cantilever access walkways, whereas longer span lightweight steel framing was used to span the roof over the central space. Ultimately, designing the structure for educational buildings is about utilising the best fit structural solution for the architectural space which may be the more traditional concrete or steel frame or more innovative timber engineered solutions to give the most flexible but viable structural solution, incorporating repeatable and adaptable details. The impetus for embracing off-site manufacture particularly with emphasis on the benefits of timber engineered solutions offers many tangible benefits including aesthetics and sustainability. However, this approach must always be grounded by the proviso that the cost versus other more traditional methods needs careful evaluation, together with the robustness / fire performance, and difficulty of incorporating late design changes. It is only through ensuring this essential equilibrium that you will achieve a high-performance building which meets the needs of the client’s brief and the expectations of students and staff. Sustainability within construction: Waste not, want not.